What in the world is going on. I checked out a sales page from someone who is supposed to be my competitor (really not, I don't see him as comp) then I attempted to leave the page. Nothing wrong with this, but I wondered what would happen if I just keep clicking to stay on the page. 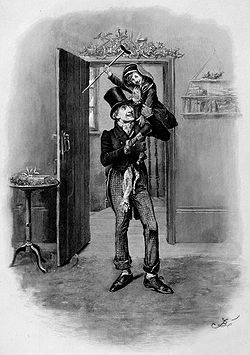 Affiliate Marketing " A Christmas Carol"
Most affiliate marketers are not gobbling up the competition and are struggling on very meagre pickings. They are largely the Bob Cratchits of e-commerce. Working until late in the evening for a hard master (affiliate marketing). Wondering whether this will ever change for the better.